In a press conference at Luthuli House on Tuesday, Secretary-General Ace Magashule confirmed that the national officials have communicated the National Executive Committee's (NEC) decision. "The NEC received a report from the national officials about the engagements with the president. NEC noted that the officials had agreed with him in principle to resigned. The president proposed to be given a period of three to six months. But the NEC also noted the uncertainty and anxiety, the NEC has taken a decision to recall President Jacob Zuma in accordance with rule 12.2 and 21.2 of the ANC constitution," Magashule said. Times reported earlier today that Magashule and his deputy Jessie Duarte were tasked by the party to deliver a letter informing him about the recall. 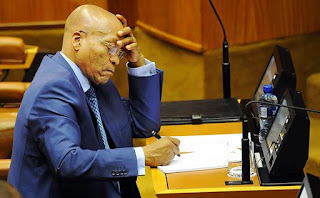 The NEC decided to recall Zuma after he refused to resign following a marathon of discussion between and ANC top brass. His imminent recall has also hindered the National Assembly's programming. The State of the Nation address which was supposed to be held on Thursday last week, had to be postponed. This led to the Economic Freedom Fighters requesting National Assembly Speaker Baleka Mbete to bring forward their motion of no confidence vote. Meanwhile ANC MPs have been called to an urgent caucus meeting in Parliament on Wednesday.